Lee Zeldin (R-NY CD 1) at his community/town forum/hall. It is difficult to imagine the effect produced in 1793 by the phrase ‘Representatives of the People.’ Neither word today sends a thrill through anybody’s spine. Both words were then alive with the emotions of a new belief. A Representative of the People, for Frenchmen of the First Republic, was the most august being that could exist on earth. The representatives embodied the majesty of the nation, and traveled in the reflected brilliance of its glory, like the proconsuls of Rome or the satraps of ancient Persia. Members of the Convention, they were the immediate wielders of sovereignty, the individual agents of the people’s might. They stood above all existing laws and authorities, for the source of law flowed through them, a mysterious current that gave their actions the attribute of justice. Plain enough men for the most part, not demanding or wanting to be fawned on, they nevertheless often found that local Jacobins received them with adulation, ordinary persons with marked deference, and counter-revolutionaries with the hypocritical and ostentatious respectfulness associated with royal courts. I’ve had cause to think about this more than a few times in my nearly three month long history of interaction with the Congressional Representative for my district, Lee Zeldin. Palmer is surely understating the difficulty of understanding how impressive an elected legislator can be. Members of Congress today tend to inspire some degree of disgust, not reverence. Zeldin, though, is interesting when one considers Palmer’s description of the deputies to the National Convention as simple men who sought no glory, yet were treated as the royalty they had replaced. In Zeldin’s case, there is another reversal: despite simply being an elected public servant, he seems to want to enjoy the deference of royalty. Thank you to everyone who came out to today’s three Town Hall events across the First Congressional District. The first Community Forum was hosted by Suffolk County Community College at their Riverhead Campus, and moderated by Suffolk County Comptroller John Kennedy. The second Community Forum was hosted by LI News Radio and the Portuguese American Center, held at the Portuguese American Center in Farmingville, and moderated by Jay Oliver from LI News Radio. The third Town Hall was hosted by Catholics for Freedom of Religion and held at St. Patrick’s Church in Smithtown. Greatest congressional district in America! I feel that I can’t help but call this progress. And in the spirit of fairness, I think it has to be said that #wheresleezeldin is a dead meme. We know where he is. The substantial issue now is the style of his appearances. Read over that post again. Notice anything interesting about how he characterizes the events? He switches back and forth between calling them “town halls” and “community forums.” Broken down to their root meanings, these are somewhat interchangeable terms, but I’d argue that this distinction matters. Some residents of the First Congressional District, upset with the Trump administration and some of the positions the congressman has taken, have demanded that Zeldin hold a “town hall” meeting in the district to answer constituents questions and hear their concerns. 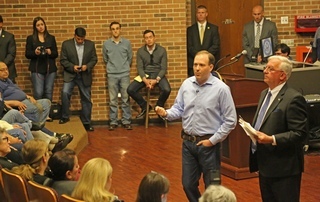 Zeldin has resisted their demands and has said he did not believe a town hall meeting would be productive. In February, he held a “telephone town hall” — where residents were able to call into a conference line. More than 9,000 people joined the call, Zeldin’s spokesperson said afterward. Are we? Should we be? Is that really the point of all this? Things are only getting worse. This past year, nearly 20 million American citizens opted not to get healthcare insurance, with 6.5 million paying the penalty and millions more asking for a hardship exemption from the penalty. The American people want change and President Donald J. Trump promised to repeal and replace this disaster. Obamacare is in a death spiral. We need affordability, better access and more choices; all while ensuring a smooth transition to a better reality. Options are pouring out from the GOP to help with this desperately needed rescue mission for health care in America. Obamacare is collapsing under its own weight. It has created higher premiums, higher deductibles, and cancelled policies. For these reasons and many others, health care in America is quite literally on the verge of collapse. When an individual has to pay $8,000 for their deductible, they feel like they don’t even have health coverage at all. If you cannot afford your insurance policy, then you do not have access to it. Collapse! The literal verge of collapse, even! This all sounds pretty grim, no? Lyin’ Lee once again followed his leader like a whipped dog. His only reaction to his party’s abject display of incoherence and impotence was to post, “And now Obamacare repeals itself.” Perhaps even more telling than anything is false wonksiah Paul Ryan’s crestfallen admission that “We’re going to be living with Obamacare for the foreseeable future.” He clearly doesn’t see the ACA as facing imminent self-destruction and is strangely unconcerned with the effects of living with it long term. More distressing seems to be the humiliation this defeat has inflicted on him. This calm, snide, petty reaction prompts some serious questions. I thought the ACA was disaster with numerous victims, collapsing, death spiraling, forcing hard working people into destitution, all sorts of improbably awful things. The situation seemed quite dire, with many peoples’ health and livelihood on the line. What is their response now? To give up, blame the opposition (which they never made any effort to engage), and wait for the ACA to collapse, presumably causing widespread harm. Did they ever care? Did they ever really believe the ACA was so bad? It seems impossible that this could be the case because if so, Trump wouldn’t be having a minor resigned temper tantrum and Lyin’ Lee wouldn’t be following suit. One or both of them, or the whole Republican party, would be going back to the drawing board to figure out some alternative, see why it failed, what could be better, because if the ACA is that bad, how can they justify this childish behavior? How can they give up and let their constituents and supporters keep suffering under the unrelieved burden of Obamacare? Either they don’t care or they don’t believe it is that bad at all. Now if you, the reader, think the ACA is so bad, how can you tolerate this response? Or did you ever really believe it was that bad? Is this just a game to you…? Mr. Zeldin, who had been a firm supporter of the much-maligned bill, said that the bill was hamstrung by the “Freedom Caucus” faction of the Republican Party who would not support it, largely because they thought it did not go far enough in repealing the Affordable Care Act adopted by Democrats and President Barack Obama. It’s not surprising that he’s aligning himself with 45 against the Freedom Caucus. It’s more surprising when he doesn’t follow the leader. But it’s interesting that he echos some of the conventional wisdom of liberal postmortems of the AHCA: that the GOP was incredibly effective as opposition but they have no ability to govern. One wonders now what compromises he’s willing to make, and more importantly, what compromises his conservative base in CD1 is willing to put up with. Oh, and pretty words aside, they still don’t have a plan. Further update: Honestly, at this point, who knows how long they’ll keep this gong show running. 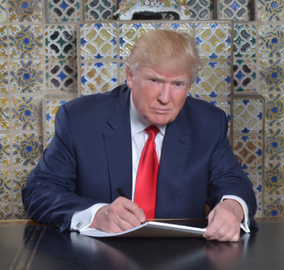 The Sharpie and legal pad of Presidential dignity. This post is an attempt to work out an apparent paradox: why it is that any economically struggling Americans would see a champion in a billionaire businessman with a golden toilet most famous before his political career for ritually firing people on a TV game show? Some would say that there’s no paradox, they were never motivated by any economic distress, that their prime motive was racism. There is much to support this idea, but I think the dichotomy – race or economics – misses something. They are inextricably intertwined such that economic plight is blamed on an assumed racial favoritism. Still, though, the catchphrase of The Apprentice: “You’re fired!” Can it really be that any American employee would find a man famous for that phrase to be an economic ally? To understand why requires understanding the ways in which capitalism and authoritarianism mutually reinforce each other. It’s a theme I’ve written about before, but which has rarely if ever been so blatantly and grossly relevant to our political reality as now. There is much to say about the amazing new political reality in which we find ourselves. For now, I want to talk about taking politics to a local level, something progressives (a “popular front” term encompassing liberals and leftists alike) are not used to. It’s something I’ve been learning to do for the past few weeks. As part of that, I’ve been involved in attempts to make the Congressional Representative for my district (District 1 in New York), Lee Zeldin, more responsive to our interests. The impetus for this is a strategy developed and advanced by a group of former Congressional staffers for a progressive audience. Called Indivisible, it emphasizes what members of Congress respond to and the need for progressives to fight like the Tea Party. So, on January 28th, I participated in a protest action with the aim of informing Zeldin that his constituents feel he is not communicative enough with and responsive enough to them. We had to stage this outside the entrance of a restaurant on the night when Zeldin was to be honored by the Rotary Club with a “Man of the Year” award because his personal appearances in the district are so rare. “As for the protesters at the Rotary Club dinner, it is greatly unfortunate that they chose reprehensible tactics to harass attendees, including banging on the sides of the cars driving by and jumping in front of cars to stop them. Requiring a police presence just to get cars through into the venue does not reflect well or help their cause,” [Zeldin’s communications director Jennifer] DiSiena said. These are, to be clear, lies and convenient half-truths. I was there and I never saw any banging on cars. The police did have to remind us once or twice to keep to the sides of the road, but this is basically over-enthusiasm to get our message heard. Some may have leaned or stepped forward to make sure their signs were seen, but no one “jumped in front of” any cars. Now, there were a lot of people there. It’s possible that things like this happened out of my sight. We’ll store this possibility away for later once we have a fuller understanding of the meaning and purpose of this kind of claim. This is perhaps the most significant thing to come out of Zeldin’s office about the possibilities for progressive local political action. As I mentioned, the Indivisible movement is an effort to get progressives to fight like the Tea Party. How can we characterize the Tea Party movement? Were they “conservative activists” who “held strategy meetings” and created “political theater” at the functions of members of Congress? Yes, but whatever else you want to say about them, they were simultaneously concerned constituents exercising their Constitutional rights to confront their Congressional representatives. Here, Zeldin’s office pretends that these are mutually exclusive. This characterization demonizes his own constituents as some kind of shadowy political cabal with no legitimate grievances and a desire to create spectacles for no productive end. Perhaps he would be better served by considering why his constituents are so displeased with him. Clearly, delegitimization by several means, such as slander and othering, are what we can expect. Since that is Zeldin’s unmistakable defensive method, I think we need to consider how such tactics work and develop a more productive understanding of protests and the things that happen there. The claim of “banging on” and “jumping in front of” cars is part of a larger rhetoric of political violence. (It is telling that they had to reach for really low-grade misbehavior like this.) Its method is to taint any protest with the sin of violent behavior. This, to be clear, is how it works regardless of anyone’s intent. We can see this in the reactions to protests of professional bigot-troll Milo Yiannopoulos’s speaking engagement at Berkeley. 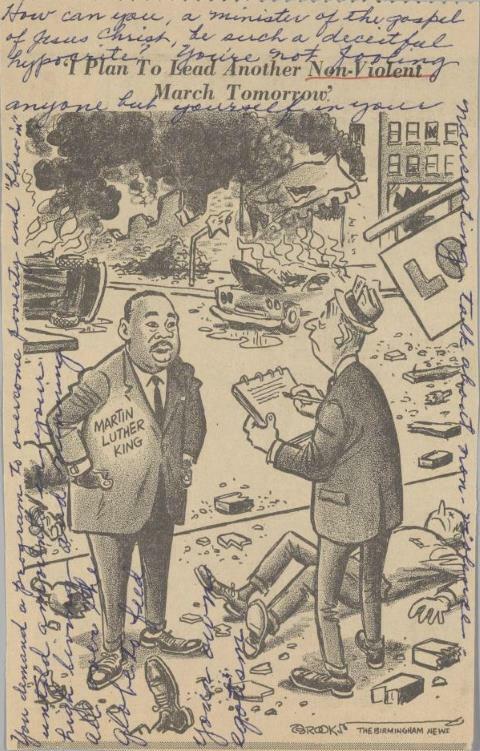 The focus of the rhetoric is on the violence, not the cause, not the overall protest, not the object of the protest. Look for the word nonviolent to appear in scare-quotes, for calls for the whole protest to account for the violent part, for claims of the hypocrisy of any and all nonviolent protesters on account of only some of them. But this is not limited to opponents of the cause. Those who are either neutral or even sympathetic pick this rhetoric up and run with it. They express a moralistic concern: that while they can see the protesters’ point of view, this violence is never justified. Whether sympathetic or not, wittingly or not, reproducing this rhetoric has one actual function: to delegitimize all protest. The fact is that these acts of violence are likely to happen. You will often find that in situations where large numbers of people are agitated enough to protest en masse, some of them will be agitated enough to commit violent acts. (And even if they don’t, political opponents and agents of the government can and do provoke violence to provide a pretext for crackdowns.) This is why I say that the function of this rhetoric is overall delegitimization. You often just can’t have one without the other, and those who aren’t violent do not actually have to answer for those that are. Yet this rhetoric puts them on the defensive. You’ll note that I have not made any token distancing condemnations of the “of course this is awful, but…” sort. That’s precisely because I refuse to be put on the defensive and thereby become complicit the attempt to slander my own political actions. I will be frank as well that I do not believe in blanket condemnation of political violence. In tactical discussions with my fellow activists, I might discuss it critically, but I will not legitimize an opportunistic rhetoric of guilt by association. My aim is not to defend anyone’s actions from detractors (whether those acting in bad faith or those with genuine concern). Rather, I am on the offense against this kind of dirty rhetorical trick. When Republican governments are gearing up to crack down on protest actions, there is nowhere else that this delegitimization goes besides suppression of all active political dissent. If you are an opponent of my causes: I see you and I see what you are doing. You’re not fooling this one. If you are not, and especially if you feel somewhat sympathetic to them, please think a little more carefully about who actually benefits from your expressions of concern and calls for the moderates to condemn the extremists. We are in for a long hard road politically, and I can already see the effort to delegitimize myself and my political actions at the local level. Don’t help those who want to silence me. Update: I recently found an excellent example of why this matters. “Michigan Republican suggests ‘another Kent State’ for liberal protesters.” Please do not enable people like this by adopting their framing of protest actions. Update (2/9/17): Supposedly, Protesters Force[d] Zeldin to Change Office Policy. I have to say I like the implication of the URL more than the current headline. Not really clear to me that given the possibility of having to face his constituents, changing his office policy was his only option. However, I want to call attention to a sharp observation from one commenter about a similar statement from an Arizona Representative: “‘(The forum) is about trapping people in a political ambush for political theater,’ this is the exact quote from Zeldin[‘]s office as well. The Conservative Obstructionists were given a script to repeat when anyone wants to meet with them.” It’s not quite an exact quote, but it uses the same scare-term, “political theater.” Seems like a consistent line and strategy has formed. These are the same obstructionists who got together this past Saturday to do their own ‘Mock Town Hall’ and demonstrated exactly why Congressman Zeldin and most NY-1 constituents won’t associate themselves with them, declaring at the Mock Town Hall that it’s okay to shoot up black churches, multiple times trying to connect the President of the United States to Nazism, criticizing the Congressman’s concern for homeless veterans, and their so called ‘people’s candidate,’ launching a tirade against the President. Dishonest tactics to delegitimize dissent like this are another example of Trumpism coming home. Zeldin is practically a miniature local avatar of the Donald at this point. The American revolutionaries emerged from a Puritan-Quaker culture shaped by the hardships of colonial life with the savage frontier in front of them and the Atlantic Ocean at their backs; the French revolutionaries emerged from a decadent Catholic culture shaped by court life and European rivalries. Both parties cried “Liberty!” but one produced the Bill of Rights and the other produced the Terror. The cultural distance between 21st-century Anglo-American liberals and tribal jihadis in the Hindu Kush is rather greater than was the distance between Thomas Jefferson and the Abbé Sieyès. I’m also not going to talk very much about the Orientalist musings into which this is awkwardly embedded. I just want to address a few points on the histories of the American and French Revolutions. Williamson has not cited any sources for this brief lesson, and while it’d be unreasonable to expect detailed citations for such an off-hand comment, it forces us to rely on his own personal authority as a “roving correspondent” for the National Review, which does not fill me with confidence. I won’t be citing anything either, relying on my personal authority as a student of history whose research focuses on the influence of the French Revolution on the United States and comparative revolutions, but I’d be happy to do so for any of my claims on request. So what’s the problem? It may seem too small, too petty, to get worked up about. But that’s what’s so infuriating: this was not a well-thought-out explication of history, which indicates that this is what Williamson comes up with by absentmindedly scraping around the bottom of the history barrel. It’s the thoughtlessness of it that’s the problem, the fact that these kinds of cliches and factoids and mythic narratives are what so many people turn to in order to understand our past and our place in the world. Where did these ideas come from? Why do they keep plaguing us? And how do we get rid of them? Apparently, The Economist magazine published a review of Edward Baptist’s The Half Has Never Been Told: Slavery and the Making of American Capitalism that was too hot for them to handle. They have since retracted it. Much of the coverage of this review focuses on its explosive final lines: “Mr Baptist has not written an objective history of slavery. Almost all the blacks in his book are victims, almost all the whites villains. This is not history; it is advocacy.” Sure, this is bad enough to deserve a retraction, but what does it mean? And is there anything at all of merit in the review? I set out to find out, and in so doing, uncover the mystery of black slaves who weren’t victims and white masters who weren’t villains. …Mr Baptist, an historian at Cornell University, is not being especially contentious when he says that America owed much of its early growth to the foreign exchange, cheaper raw materials and expanding markets provided by a slave-produced commodity. But he overstates his case when he dismisses “the traditional explanations” for America’s success: its individualistic culture, Puritanism, the lure of open land and high wages, Yankee ingenuity and government policies. Take, for example, the astonishing increases he cites in both cotton productivity and cotton production. In 1860 a typical slave picked at least three times as much cotton a day as in 1800. In the 1850s cotton production in the southern states doubled to 4m bales and satisfied two-thirds of world consumption. By 1860 the four wealthiest states in the United States, ranked in terms of wealth per white person, were all southern: South Carolina, Mississippi, Louisiana and Georgia. Mr Baptist cites the testimony of a few slaves to support his view that these rises in productivity were achieved by pickers being driven to work ever harder by a system of “calibrated pain”. The complication here was noted by Hugh Thomas in 1997 in his definitive history, “The Slave Trade”; an historian cannot know whether these few spokesmen adequately speak for all. So, if we assume that the review is at least honest and accurate in this summary, Baptist argues that the increased productivity of slave labor was the result of increased brutal discipline. Here, I struggle to see how “individualistic culture, Puritanism, the lure of open land and high wages, Yankee ingenuity and government policies” are plausible alternate explanations for slavery’s increased productivity. Perhaps if individualism exists only for white planters, perhaps Puritanism secretly became a major religious force in the South during this period, perhaps the “lure of open land and high wages” refers to slavery’s western expansion or the increased price of Upper South slaves in the Deep South. On the other hand, we can give ingenuity some credit, since the cotton gin did breathe some new life into slavery by making cotton easier to process, and government policies protecting the right to own slaves, and to treat them however their owners saw fit, certainly played a bit of an important role. Another unexamined factor may also have contributed to rises in productivity. Slaves were valuable property, and much harder and, thanks to the decline in supply from Africa, costlier to replace than, say, the Irish peasants that the iron-masters imported into south Wales in the 19th century. Slave owners surely had a vested interest in keeping their “hands” ever fitter and stronger to pick more cotton. Some of the rise in productivity could have come from better treatment. Unlike Mr Thomas, Mr Baptist has not written an objective history of slavery. Almost all the blacks in his book are victims, almost all the whites villains. This is not history; it is advocacy. In other words, if some other slaves, whose testimonies Baptist did not use, recalled decent conditions, this reflects masters having had an interest in keeping their property in good condition. At last the mystery is revealed: it is possible that some blacks weren’t victims and some whites weren’t villains in the antebellum South because some blacks were maintained as healthy and well-fed livestock by white masters who had the same conception of enslaved human beings that modern “free range” ranchers have of cattle! Well… that seems like damning with faint praise, doesn’t it? In summary, I can only say that there is very little of value in this review and that what little there is, is unintended by the reviewer. In trying to defend the now-discredited conception of slavery as a generally benign paternal system, the best argument the review could make implicitly relies on dehumanizing slaves so that the logic of the property owner’s interest in cultivating his property can apply to people treated as valuable instruments of another’s profit. In doing so, the review reinforces the old truth, going back to the antebellum debates over abolitionism, that some theoretical relations of kindness and decency between hypothetical slaves and masters do not negate the evil of the system overall. Treating people as property is monstrous regardless of how big an investment a person with a price might be. “Freedom Industries” and the Freedom of Industries. Apparently, when most people in my area think about West Virginia, they remember some incident involving a traffic jam. I mostly remember news stories about the trials and tribulations of the people involved in mining the coal that powers our electronic lives: their labor struggles, and the safety disasters which necessitate their struggles. The latest from West Virginia is a chemical spill that affects the drinking water of 100,000 to 300,000 people in the area of Kanawha, WV. In the midst of this calamity and the human suffering it has unleashed, there is something almost poetic in its sublime rightness: the company responsible is named “Freedom Industries.” Is there any doubt as to what kind of freedom the company’s founders had in mind? If so, this incident is instructive. Environmental regulators in the state found that the chemical company took “no spill containment measures” to stem the leak, according to the Charleston Gazette. Regulators say the company violated the Air Pollution Control Act and the Water Pollution Control Act, the Gazette reported. …State regulators said Friday that the company never told them of the leak, and found out only after residents complained of a strange smell, according to the State Journal. Health, safety, and environmental regulations, we are often told, are infringements on freedom. They burden job creators with red tape that holds them back from their glorious pursuit of enlightened self-interest. Under the regime of this freedom, taking no measures to contain spills would be a perfectly legitimate business decision, and there would by no “acts” regulating pollution to violate. Anyone affected by the outcomes of any accidents which result will have recourse to lawsuits to resolve the issue; depending on how serious you are about freedom, it might be resolved by a privately hired arbiter! No conflict of interest, no distortion of justice from unequal wealth, could be imagined here. Experts say there is no way to treat the tainted water aside from flushing the system until it’s in low enough concentrations to be safe, a process that could take days. People across the nine counties were told not to wash their clothes in water affected, as the compound can cause symptoms ranging from skin irritation and rashes to vomiting and diarrhea. Even as the National Guard made plans to mobilize at an air base at Charleston’s Yeager Airport, many people — told to refrain from using tap water — weren’t waiting for outside help. The “National Guard,” eh, comrade? That sounds like some kind of collectivist use of government force. The inappropriate kind, that is, the kind not applied to bombing people in foreign countries and suppressing the poor. Using collectivist government force to help people? When did I agree to pay for these peoples’ water? There are much freer alternatives, after all: perhaps the people affected could have had a bit more foresight and individually purchased various forms of insurance and personal countermeasures to pay for disaster recovery. I can foresee no problems with them being able to afford this, once the government stops sucking them dry with taxes. Private disaster relief companies will provide much more efficient responses than the bloated government. State Attorney General Patrick Morrisey warned residents about price gouging on water, ice and other items, calling it “just plain wrong” to inflate prices and encouraging those who have seen such practices to report them to his office’s consumer-protection division. Who let this Marxist radical into office? Doesn’t he understand the clear benefits of so-called “price gouging,” that is, the market at work? It is the most efficient way of rationing now-scarce resources. Those who cannot afford the new, fairer price of water can presumably just “economize” on their daily basic needs. Perhaps in the future they will have the foresight to devote more of their generous disposable income to stockpiling bottled water. In any case, the higher prices are sure to attract more intrepid suppliers, somehow, at some point. There’s no need for the jackbooted thugs of the “National Guard” to interfere, spending your tax dollars to provide the biological necessities of human life. To step back from vitriolic polemic, there’s one other thing I think of when someone mentions West Virginia: its long history of labor struggle. With “freedom” like this increasingly on offer, I have a feeling that state might someday shock the country in the best possible way. Divulge your email address and click below to send my stunning insights straight to your inbox.